I am such a lover of all things chocolate I could easily name this blog "For the Love of Chocolate." Thus, the reason I jumped at the opportunity to get a sample of the fragrance meaning literally "bitter chocolate" in French. 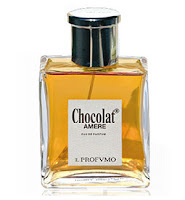 My first interaction with Chocolat Amere by Il Profumo was before I knew it was designed for men, and I found it an interesting, warm scent perfect for fall. I pictured myself adorned in a chestnut cashmere wrap sweater, slim, tailored pants and stiletto boots, carrying a pumpkin flavored latte with loads of shopping bags and contemplating my holiday plans. When Mr. TMH caught whiff, he conjured images of bulky sweaters, hair that smells of burning leaves and fresh air, jeans, hot cocoa, college football and bonfires. Despite the opposing details, the male and female imaginations arrive at the same destination. Little doubt lingers regarding the season appropriate for this scent. Considering the composition of this fragrance, "bitter" encompasses its charms exactly. This is chocolate that is not quite sure it wants to be chocolate. Moody and elusive, it gets up and walks away just when you are within its grasp. The notes that predominate are the luscious woods and spices and the come-hither galbanum. At first whiff I detect a fruity aspect, although I'm not quite sure where that comes from since a fruit note is not listed. 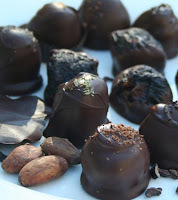 The dark chocolate soon introduces itself as well as a mysterious floral note. Upon drying, the galbanum gloriously shines through and takes me back to my Must de Cartier wearing days. The deep, dark chocolate intermittently pops out - although not for long - through the remainder of wear accompanying piquant nutmeg, earthy sandalwood and meditative incense. A winner in my book, although it certainly falls in the unique and interesting domain. Little sillage makes it one to wear when cuddling up by the fire with a book, while its sensual charisma makes it one to wear when cuddling up by the fire with your significant other. Il Profumo Chocolat Amere is available at Luckyscent, 100mL retails for $90. I have not found other retailers for it yet. Images courtesy of grocersdaughter.com and luckyscent.com. It certainly sounds very interesting and it being amere is a plus for sure, in a sea of sickly sweet chocolate perfumes. Thanks for the write up and LOL on the different images male and female minds come up with! Wow, that sounds just wonderful! I don't care if it's supposedly for men either - I want some! Especially since it's not too sweet, like every other chocolate perfume I have tried.